Cerabike Wax Lube is a fairly unknown lube, compared to the big brands like Muc-Off, Rock ‘n Roll, Pedros, Finish Line, Squirt or Morgan Blue. A fellow cycling friend from the Nordics pointed me to Cerabike Wax Lube, a product for both dry and wet conditions, available via Decathlon and Amazon. Very unique is the combination of PTFE, graphite and ceramics in the Cerabike Wax Lube. Also the fact that its suited for both dry and wet conditions raised my attention. There are not a lot of (english) Cerabike Wax Lube reviews available online so let me share my thoughts and experiences. When I read the (translated) description on the Cerabike Wax Lube product page it clearly reminds me of the Muc-Off Hydrodynamic Lube story of Team Sky’s marginal gains efforts. 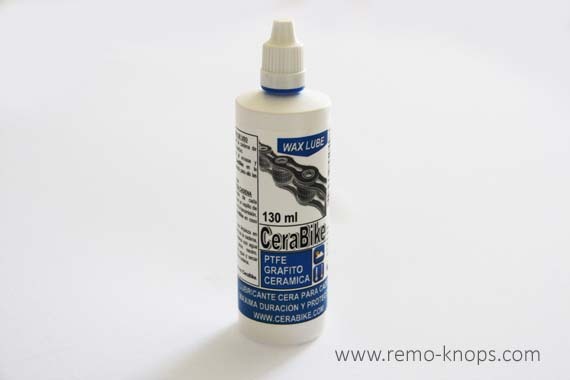 Cerabike Wax Lube is a waxy water based emulsion that has hygroscopic properties. These hygroscopic properties allow Cerabike Wax Lube to adapt its lubrication characteristics to the environment in which the cyclist moves. When you cycle in a humid environment, Cerabike Wax Lube will have a gel form that increases lubricity and transmission. On the contrary, if the atmosphere is warm, hot and dry the Cerabike Wax Lube will act as a dry wax, that facilitates non-adherence of dust and dirt on the ground. Most lubes are either performing well as a dry lube or as a wet lube, and most major lubrication brands offer both types of lube. For example the Morgan Blue Racing Oil that I’ve used is suitable for both weather types as well, but leaves a black film on your chain -eventually attracting dirt. Especially on the rear derailleur pulleys. Squirt washes off quickly in rainy conditions, but leaves a light grey film on your chain. Cerabike Wax Lube incorporates PTFE, graphite and ceramics in their composition, which increases the protection of transmissions by reducing friction and adhesion of dirt (sand, dust, etc.). So it is perfect for cyclists who value above maximum protection all components of your transmissions. Personally I think that the mix of PTFE, graphite and ceramics in the Cerabike Wax Lube seems a very good and unique combination. 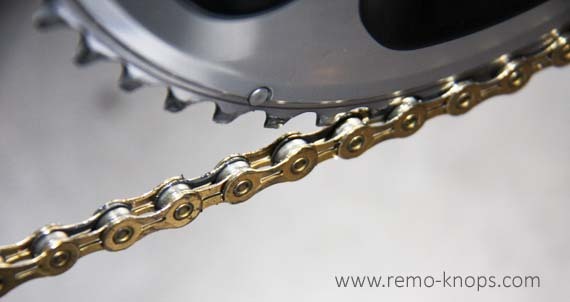 With the narrow 11-speed chains (even a Dura Ace 9000 chain) good lubrication becomes more and more important to extend the life of your drive train components. I replaced the my current Dura Ace 9000 chain with a KMC X11EL chain, the one with gold titanium nitride coating. For the cold and rainy months I simply wanted to test the durability of Titanium Nitride coating. This is also a good starting point to test the Cerabike Wax Lube. I’ve intensively cleaned the rear cassette, rear derailleur pulleys and the front chain rings so the Cerabike Wax Lube is applied on a clean drive train. Than I applied the Cerabike Wax Lube on the chain the night before and removed the excessive lube the next day with a piece of cloth. I was very impressed during my first few Tacx Trainer test rides. KMC chains have the reputation to be a little noisier than stock Shimano Dura Ace 9000 or Shimano Ultegra 6800 chains. It doesn’t save you a lot of watts, but the Cerabike Wax Lube made the chain feel smooth and easy running. Switching gears was instant as well, while I didn’t see the gold KMC chain turn black. Outside I did a ride during dry autumn conditions, which means a lot of leaves and some dirt and pools on the road. Still smooth running and no lube wash off from the splashing water. During a couple of follow-up rides on both Tacx indoor trainer and outside I could see less of the grey dirt sticking on the chain compared to for example the Morgan Blue Racing oil. Cerabike Wax Lube has a unique composition with PTFE, graphite and ceramics. It looks milky just like Squirt but doesn’t leave the grey film behind on your chain. Simply apply it on a clean drive train the day before your ride and remove the access Cerabike Wax Lube with a simple cloth and enjoy your ride or race. The only disadvantage is that Cerabike Wax Lub is available for direct sales in Spain via Amazon or Decathlon. I contacted the local Decathlon store in the Netherlands, but they don’t have it in the assortment. Cerabike is a relative small company from which can be ordered directly. I followed the procedure here and ordered two bottles of Cerabike Wax Lube directly from Cerabike. Shipping times were ok and the price-point of € 21,80 for two 130 ml. bottles is very reasonable. 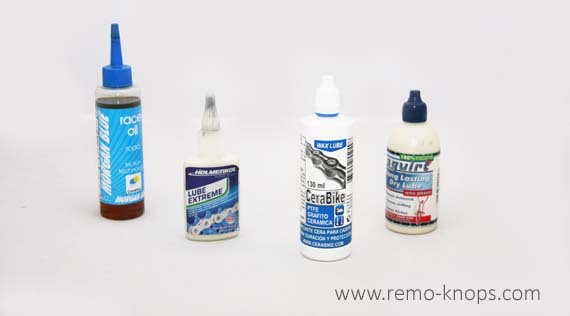 Compare it for example Muc Off Hydrodynamic lube which costs around € 22,– for a 50 ml. bottle. Summarizing I’m really enthusiastic about the Cera Wax Bike Lube both for practical performance and price-point. I will use is as my preferred product for the upcoming season. So order your Cerabike Wax Lube and enjoy your ride. wheelsONfire Thanks for your nice comment. Your advice has been much appreciated. Good news Cerabike started to use the internal Amazon logistic service, so that you can find our Cerabike Wax Lube in Amazon France, Germany, UK and Italy. See screenshot below for Amazon Germany (and I also tested Amazon France). Hey!, I found this information for you: "Cerabike Wax Lube". Here is the website link: https://www.remo-knops.com/5513/cerabike-wax-lube/. Thank you.